Three weeks. Just three more weeks until the official start of spring. SPRING! Just typing or saying the word aloud makes me happy - even though that word is often followed by one of my least favorite terms - cleaning. The results are always worth the work, though. 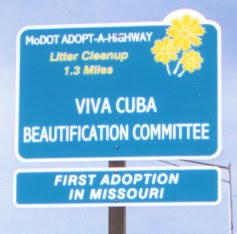 And it's just about time for travelers to spot Missouri's Adopt-A-Highway volunteers hard at work tidying up the state, kicking off the program's 25th year! More than 4,000 groups care for 6,281 miles. They sign up to pick up at least one-half mile of urban roadside or two miles or rural road, collecting litter at least four times a year. Doing so, they save taxpayers $1 million and get some good exercise. Civic groups, schools, scouts, clubs and other organizations receive recognition for their work on blue Adopt-A-Highway roadside signs. Several families choose to make their effort a living memorial. Companies can choose the Sponsor-A-Highway option in the St. Louis and Kansas City areas and receive roadside recognition for their contributions. Litter pick-up isn't the only kind of adoption. Some folks sign up to mow roadsides and other groups landscape with native wildflowers and grasses. The landscapers work in concert with MoDOT and the Missouri Department of Conservation to choose plants that have the best chance to survive, support wildlife and provide extra benefits such as erosion control. Is It Time for "The Talk"? The day is coming faster than I want it to come. I'll have to sit her down and have "the talk." It will be awkward. I'm going to stumble over my words. I'll need to be ready for any emotional outbursts. But it's all a part of life and I have to accept that. "Mom," I'll say. "How do you feel about your driving? Do you think you're still a safe motorist?" She's already cut back on her nighttime driving. It makes her uncomfortable. So her friends or one of my family members take the wheel instead. The day she hands over the keys for good will be tough on this very independent lady, but she sees it coming, too. "The last thing I want," she says, "is to hurt someone because I caused a crash." Older drivers are the subject of a MoDOT-sponsored gathering this week. Experts from around the state will discuss the road safety needs of our aging population. On their minds is this fact: Although drivers 65 and older account for eight percent of all miles driven, they comprise 17 percent of traffic fatalities. We've got a lot of company in addressing the issues. A report released today from TRIP, a transportation research group, describes the efforts of state departments of transportation to address older drivers. TRIP reports that the growing ranks of older Americans "will far outpace previous generations with their level of ability and activity. Serving their needs will require a transportation system that includes safer roads, safer vehicles and improved choices." Visit http://www.savemolives.com/older-driver.html now and in the months to learn more and to find tools to help older drivers you know and love. MoDOT is preparing for final projects in the transformation of U.S. Route 71 from national highway to interstate standards. Why? The change will increase economic opportunities for Missouri and enhance the safety of travelers. When businesses consider locating in Missouri, one of the first factors they consider is access to quality transportation. Preference is given to locations that are near to interstate highways. The I-49 designation will ensure this factor is not an obstacle for the communities along the corridor between Kansas City and Joplin. Plus, the I-49 designation benefits Kansas City’s development as an “inland port” for the flow of freight throughout the country. Traffic on the US 71 corridor between Kansas City and Joplin already consists of 30 percent trucks. The route connects Kansas City's interstates with Interstate 44. As freight volumes are expected to increase, we believe upgrading U.S. 71 to interstate standards makes sense. Future projects in Arkansas are expected to complete I-49's path from New Orleans to Kansas City, making road transport of freight to and from the Port of New Orleans more efficient. This has exciting implications. In 2014, the expansion of the Panama Canal will be complete. Super container ships that are now unable to squeeze through the canal will be able to bring their cargo into the Port of New Orleans. The drive from New Orleans to Kansas City is shorter than the drive from the west coast ports, so the cost to bring goods to the midwest should fall. That's good news for consumers. The transformation is more than just a name change. In order to be classified as an interstate, a route must meet stringent requirements. U.S. 71 largely met the requirements from Kansas City to Missouri's southern border. However, because no at-grade intersections are allowed on an interstate, several interchanges were either built or are underway. Intersections with ramps and overpasses are much safer than those that occur at-grade (without overpasses or underpasses). They virtually eliminate T-bone-type crashes. We believe the investment made to transform U.S. 71 into Interstate 49 will pay off both economically and in safety for Missourians in decades to come. Okay, I admit it. Sometimes I include waaaaay to much detail in the pieces I write. I've learned to write, walk away and come back to edit later - saving many forests worth of trees in the process. 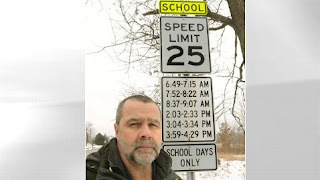 I bet the person or group who ordered this sign for a school zone in Oakland County, Michigan wishes for a do-over with the editing pen. Maybe stating that the 25 mph limit applied from 6:30 a.m. to 4:30 p.m. would get the point across better. Thanks to ABC news for the photo. Today's Wall Street Journal included an article about cars that have touchscreen technology, Internet access and Twitter functionality built in. It's interesting how quickly we've gone from, "No, he's on his way to Springfield. I'll call that office and ask them to give him a note to call you." to folks scheduling conference calls during drive time and parents texting kids from parking lots. Having phone and computer access on the road makes handling work and family business more efficient. The safety aspects continue to be debated.